Family members mourn the death of Anil Majumder, an editor of an Assamese daily Aji, who was shot dead March 24, 2009. Protest against the killing of an editor of Assam continues, as the journalists declared and implemented a series of protest and demonstrations. A protest meet at the cremation ground appealed all the media persons of the State to participate in the program demanding to nab the culprits and compensation to the family of the editor. 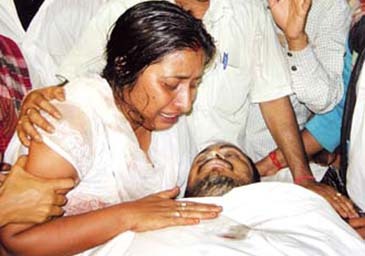 Anil Majumder, an editor of an Assamese daily Aji was shot dead at night of March 24, 2009 in front of his residence in Rajgarh locality of Guwahati. The killers were waiting for the young editor to come back from the office and soon after the assassination at around 10 p.m., they fled. Hailed from Nalbari district, Majumder, 39, left behind his wife and two daughters. The police are yet to break any significant clues, though the department issued the sketch of the killer, prepared with the information fed by the driver of the editor. Assam has lost over 20 editor-journalists in the last two decades and surprisingly enough not a single perpetrator of these heinous crimes had been booked under the law. The victims include Kamala Saikia, Deepak Swargiary, Kundarmal Agarwala, Manik Deuri, Prarag Kumar Das, Ratneswar Sarma Shastri, Nurul Haque, Jogesh Uzir, Dineswar Brahma, Girija Das, Monikan Das, Ranbir Roy, Prahlad Gowala, Maslimuddin, Bodosa Narzary, Jagajit Saikia etc. The killing of Anil Majumder has brought many issues to public forum. He was a brave journalist but allegedly often ended up in biased reporting. He was prolific, but most of the time, he might got used by somebody. From a local media correspondent in Nalbari, Majumder owned a daily newspaper in Guwahati, which shows his extra-ordinary zeal and hard labour for achieving success. But on the way, he grew enemies from different sections in the society including the media fraternity. development prior to the polls scheduled in the next month. More over, the daily neither enjoyed high circulation nor support of influential readers. Similarly, an armed group (United Liberation Front of Asom) leader denied their involvement in the killing of Majumder. He was understood as being closed to the outfit, for which Majumder was even arrested earlier. The police even suspect that he was involved with the militants for many ‘non-journalistic’ activities. The last theory that is gaining momentum, the editor was eliminated by a third force because of personal vendetta. A senior lawyer of Gauhati High Court, Nekibur Zaman, disclosed in a media interview that Majumder received a threatening message from a senior police officer few days back. Majumder informed about the message to Zaman and also a minister in Tarun Gogoi’s cabinet. Even a recent report in ‘Aji’ says that the media house has decided to start an investigation to find out the perpetuator of the crime. They have included different issues under the purview of investigation more precisely the recent conflict between Majumder and a rich business man regarding a land dispute. A case on the issue is also pending in the court. The Journalists' Action Committee, an umbrella organization of media bodies of the State had issued an ultimatum to the government to nab the killer within a week. The committee had recently submitted a memorandum to the State chief minister Tarun Gogoi urging him to initiate to arrest of the killer and the perpetuators. Earlier most of the Assamese dailies were published with blank editorials on March 26 as a mark of protest against the gruesome assassination. It was decided during the protest meet at the cremation ground on March 25 where hundreds editor-journalists attended the meeting and expressed anguish at the failure of the authority to ensure protection to the media persons in the State. Meanwhile, the Editor’s Guild of India with the Reporters Without Borders, Committee to Protect Journalists and International Federation of Journalists have condemned the killing of the editor. The voice of protest has been raised a number of media bodies and also socio-political organizations in Assam.